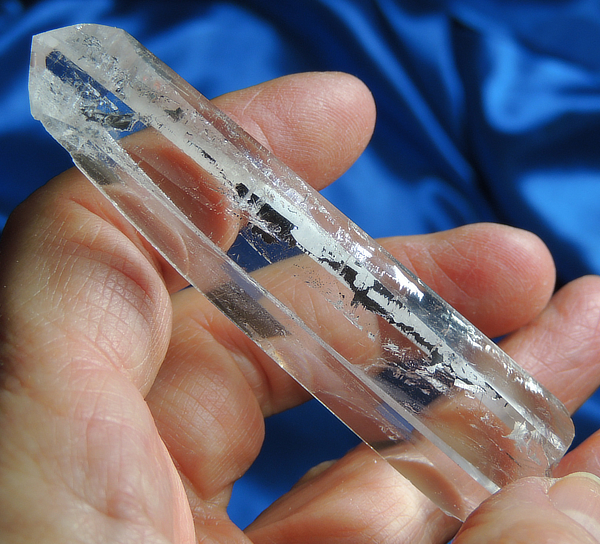 This is a nicely-clear quartz wand from Brazil weighing 1.4 oz and measuring 3.25” by 0.8” by 0.6” with slanted and healed base. He has a channeler termination and like all of this lot, he has been partially polished … five sides and part of the last side as well as all of his faces. The remaining portion of side features a rather intense display of Draco glyphs best examined with a loupe as they are layered, raised, curved and intricate. The polished areas carry the memory of the stars, but most importantly … they all hold information for his special Keeper. There is a ding on one side at the base edge that was not polished out and it detracts from him in no way! Long story … this Spirit is another “treasure find” … about six years ago, I received a lot of quartz that had been partially polished to show the clarity of the quartz. It was a large shipment and was delivered in large drums with the drums often containing multiple types of quartz. I thought I had separated them all, but apparently not – only a few and another much larger portion of the lot was unpacked in my recent reorganization! Now, in late October, I took a “girls’ long weekend” with our daughter and her three daughters to Florida and while there, we of course, took in some shopping. We happened across a very eclectic little shop that had some crystals in it and like this lot, they were partially polished but I found one with strange starbrary markings and no polishing and I bought it … well, as I unpacked the remainder of this lot I had received … there were those very same markings and indeed, there was a companion crystal to the one I had bought in Florida! Working with the two crystals together, I discovered this rare Draco connection. It had been there all along and it was now time for their starbraries to appear! The Draco connection has been very strong among many civilizations around the world – some know this constellation as a dragon while others as a snake … you see the influence on every continent and perhaps one of the most famous is Chicken Itza.The Draco peoples were among the first star peoples to visit Earth and are often considered the “Founders”. They provided guidance, science, medical knowledge and many other things to the young peoples of Earth. In a way, they paved the way for the star peoples to come! His messages leave an ancient record for the star seeds now!